Before installing TEAMserver, you should ensure that your system meets the requirements outlined in the System Requirements section, and that the necessary prerequisites have been installed or configured according to the instructions in the Installation Prerequisites section. To perform these procedures, you must be a member of the Administrators security group on the server on which you are installing TEAMserver. If you are working with a dual-server deployment, you also need to ensure that you are an SQL Server Administrator (DBAdmin in SQL Server), and that the machine account for the server has logon rights to SQL Server. 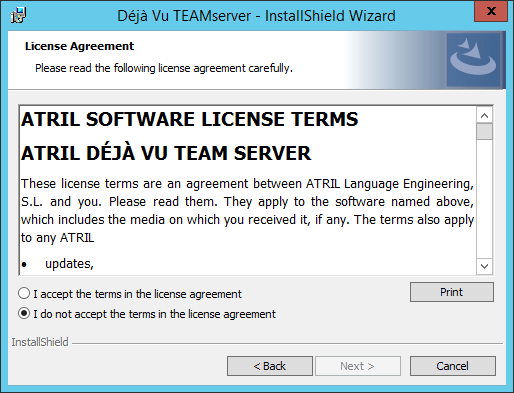 Start the installation wizard by running the installer for Déjà Vu TEAMserver. Read the License Agreement and, if you agree with the terms, check the option I accept the terms in the License Agreement. On the Database Server page, enter the name (and optionally instance name) of the server where SQL Server is installed. If you are using a single-server deployment, you can enter (local) as the server name. Alternatively, you can click Browse... to select the SQL Server instance from a list of instances available on your network. Select the Windows authentication credentials of current user option, and click Next. The Installation Progress page appears. After installation has completed, click Next. On the Complete page click Finish. The firewall should not inspect or otherwise interfere with HTTP traffic. If it does, requesting a floating license from Déjà Vu X3 may not work. Be default, ports 80 and 8081 will be used to access the TEAMserver and the Floating License service, respectively. These ports (or whatever ports you configure the TEAMserver to use instead) must not be blocked by your firewall. Configuring your firewall to redirect incoming traffic to a different port is not recommended. Some of TEAMserver’s services (notably, the Floating License Service) may respond unpredictably in these circumstances. Please consult your firewall documentation for further instructions. Add and configure user accounts for administrators, project managers, translators and any other user who will need to connect to TEAMserver. Please consult the TEAMserver User Guide for further instructions.